If your office door is constantly clogged with people dropping by unannounced, take heart: A new feature in Google Calendar could help you steal back your productive work time by letting you schedule open appointment slots for your colleagues. 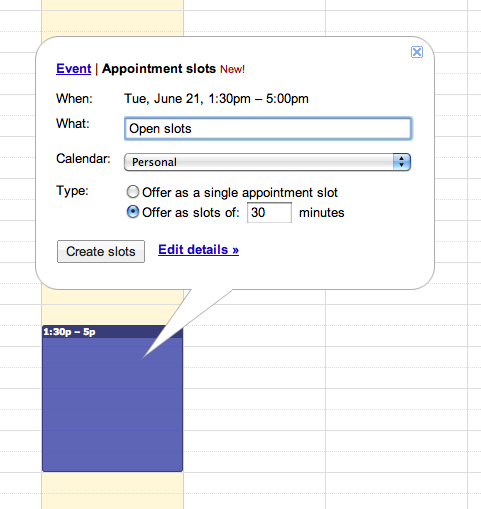 Dubbed Appointment Slots, this new Calendar feature appears when you click in the Week and Day views in Google Calendar. You can use it to schedule specific open appointment slots manually, or set up recurring times when you're willing to accept meetings from your colleagues. So let's say you've got a two-hour window on Wednesday afternoons that you'd like to open up as recurring appointment slots. To do it, select Week or Day from the Views menu at the top of the window, and then click and drag in the calendar window to select the time slot you want to open up. When the Event bubble pops up, click Appointment Slots at the top of the bubble. Confirm the date and times, and click the checkbox labeled Repeat to make this a recurring slot. You can also choose to break this up into separate 30-minute time slots by default, or keep the whole two hours intact. If you routinely expect short visits from several colleagues, the 30-minute option is great. Now give it a description and click Save. Within the details page for a given calendar, you'll find a URL for your appointment slots. Share this URL with your colleagues and they'll be able to sign up for specific slots on a first-come, first-served basis. As people sign up, you'll receive notifications and the slots will appear filled in on your calendar.